This Vick’s style vapor rub is whipped with all-natural ingredients like shea butter and coconut oil for a smooth feel and a soothing minty freshness. 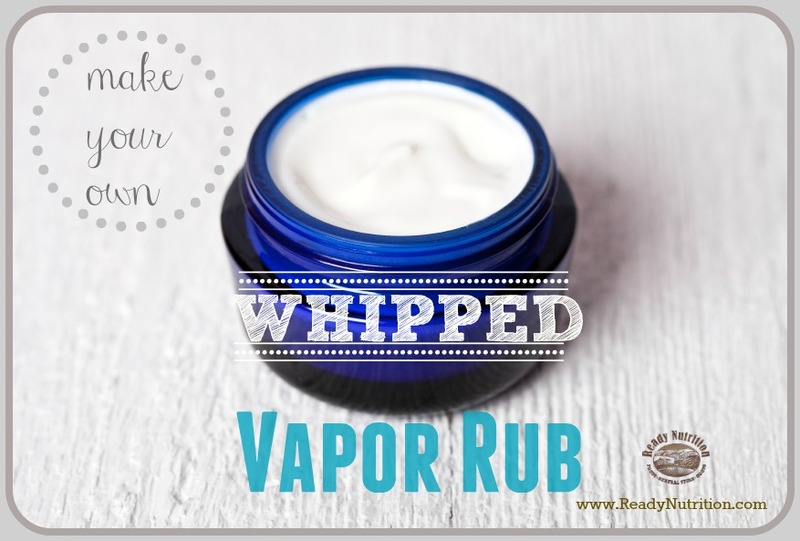 I grew up with Vick’s VapoRub always being present in my childhood medicine cabinet. When I was feeling under the weather, my mother would rub this on my chest, and almost immediately, the mentholated fumes would start working their magic. I decided to make my own whipped version of this old-fashioned herbal ointment using natural ingredients and couldn’t be more pleased with the end result. By whipping the coconut oil and shea butter together it created a soft texture that rubs on smoothly. And, since this was such a simple recipe, I had to share it! Ensure that the essential oils you purchase are therapeutic grade oils. The essential oils I used were ones that were decongestants, helped relieve symptoms associated with cold and flu symptoms, and possessed antimicrobial properties. Camphor essential oil acts as an antispasmodic, antiseptic, decongestant, anesthetic, anti-inflammatory, disinfectant, calms and gently sedates. Eucalyptus essential oil is antimicrobial, as well as an expectorant, making it a good oil to use for respiratory issues. Peppermint essential oil is antibacterial, soothes pain and has anti-inflammatory properties. The menthol cools and refreshes. Lavender essential oil is soothing and promotes sleep. Tea tree essential oil is antimicrobial, making it a good addition to this rub if the chest congestion is the caused by some sort of pathogen. A Special Note: If you plan on making a Vapor rub for children to use, reduce the essential oil amounts by half. The essential oils listed in the recipe below can be harmful to youngsters. It has ingredients that act as irritants which the body reacts to by producing even more mucous. Reducing the essential oil amounts and using small amounts on children will help reduce the reaction. In a mixer ( I use an immersion hand mixer), whip coconut oil and shea butter together until combined. About 45 seconds. Stop mixer and use spatula to bring whipped mixture to middle of bowl. Add the essential oils to whipped butter mixture and slowly stir to blend. Note: Reduce essential oils by half if vapor rub will be used on children. Pour mixture into clean containers and add lid. To use: Rub a small amount on the chest as needed to relieve congestion and reduce coughing. Also, try these vapor bath blocks to add to your bathwater. The essential oils in the bath blocks create a powerful bond and helps to ease symptoms through aromatherapy; especially those of the upper respiratory tract, nose and sinuses. Additionally, the baking soda in these bath blocks assists your body in purging toxins and softens the skin.